Does a transplanted hair include the eractor pili muscle? 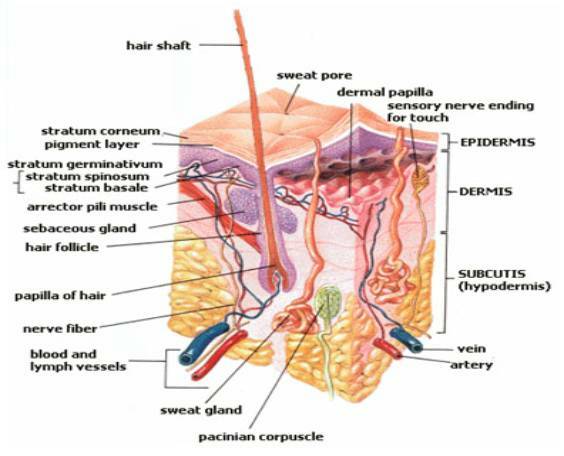 If you look at the following you see that each hair has attached a tiny muscle fiber called eractor pili. Do the hair transplant surgeon also transplant it as part of the hair follicle ? » muscle fiber called eractor pili. The erector Pili is transected during the procedure. In fact it is important that this is done in FUE since it will otherwise hold the hair in place and will rip the follicle when pulled out. I have no idea what happens to the residual muscle but based on the transection or movement of smooth muscle in reconstructive and vascular surgery, it will re-attach but will of cause be shorter. I think it would be difficult to perform a good study relating to its significance unfortunately. » » muscle fiber called eractor pili. » What is the significance of that? His question is a very important question! Most HT Docs out there always mention how important it is to extract (via FUE or FUT) “INTACT” and not “TRANSECTED” hair follicles. In regard the arrector pili muscle, which actually IS a (important) PART of an “INTACT” hair follicle AND its whole biology, it is practically impossible to extract “INTACT” hair follicles! In fact, EVERY extracted hair follicle (resp. Follicular Units), which has been extracted via traditional HT’s, IS - in fact - transected (! ), and the missing part of the arrector pili muscle have to REGENERATE, as well as the interrupted blood and lymph vessels, what’s important in general, to keep transplanted hair follicel alive. » » » muscle fiber called eractor pili. » » » follicle ? » » What is the significance of that? » His question is a very important question! » FUE or FUT) “INTACT” and not “TRANSECTED” hair follicles. » impossible to extract “INTACT” hair follicles! » transplanted hair follicel alive. cool, as important as it sounds, since it is buried underneath the skin, there is really no way to tell if the doctor took out the follicule correctly or not, does that make sense? It’s a small muscle attached to the base of each hair which, when contracted, causes the hair to stand erect (such as what happens to the hair on your arm when you get a chill). Part of the muscle could be included in a graft that is transplanted (depending on how much extra tissue is extracted with the follicular unit) but it wouldn’t serve any functional purpose. » hair on your arm when you get a chill). » but it wouldn’t serve any functional purpose. Indeed, the erector pili will be transected whether it be strip or fue. I assume that the hair will lose ability to give goosebumps in certain special situations. I will try to look up the literature to see if it can have additional effects, though I seriously doubt anything has been written about this topic. Nevertheless, it is an interesting offshoot. » That is an interesting question. » Indeed, the erector pili will be transected whether it be strip or fue. » Nevertheless, it is an interesting offshoot. special situations” are for example when your partner runs her hand through your hair - in the naturally growing areas the feeling is wonderful due to the muscles beeing gently stimulated - the transplanted area feels like you have brushes attached there that don’t quite belong to your body. Perrsonal observation. Male Pattern Hair Loss is a near universal finding in men and Female Pattern Hair Loss affects at least 60% of all women to some degree. Pattern hair loss is the most common trichological presentation to dermatologists. Diagnosis of female pattern hair loss is problematic, particularly in the early stages. Treatment options are limited, guidelines for therapy are not universally agreed, maintenance therapy is usually required and patient adherence to long term therapy is often poor. 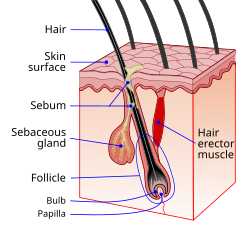 The hair follicle is a complete mini-organ that comprises epithelial, mesenchymal and neural tissue. The arrector pili muscle inserts into the hair follicle at the level of the bulge and separates the upper follicle (isthmus and infundibulum) from bulb. The bulb is the lowest portion of the follicle and undergoes cyclical involution and regeneration. In contrast to classical drawings in dermatology textbooks, a single arrector pili muscle may serve 2-5 follicles within scalp follicular units.